Junk Swap? Sign Me Up! Life is like a box of junk. You never know what'cher gonna get! Please join me on JUNKMARKET Style and add your name to the growing list of junkers ready for a good ol' fashion junk swap! Doesn't that sound fun? 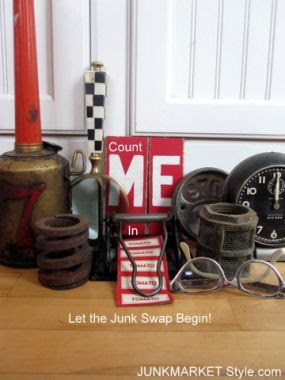 Included is a sample of Sue Whitney's junk pile to REALLY get you excited, but know there are many other piles out there ready for swappin'! Are you in? Check out the details here and I hope to see you! It is all coming together. My dining room is now CLEAN and I was happy to find a pretty decent vintage table and chair set underneath all the mess. I am going for a Rustic Industrial look which might not be for everyone, but I am really liking it! Stay tuned for more photos. I am in search of a fairly large tree branch but everything is covered in snow right now. I am also hoping the husband can look at our badly working vacuum cleaner before taking more photos. And who knows, Cassie from JunkFest may have convinced me to share *before* photos. Eep! Unfortunately toys won't be involved. I am actually organizing the dining room today! Since it isn't used very often due to having an eat-in kitchen, objects tend to pile up quickly in this room...similar to the open storage concept except a dumping action occurs here. Boo. Have you ever come across a cool piece of junk that just screams BUY ME!, knowing that you really don't have an immediate use for it? Well, of course you have! This is one of those junk pieces that convinced me to take it home. I then purchased a new glass cylinder with candle for around $2.50 total at The Flower Factory. Cylinder vases can also be purchased at garage sales and thrift stores on any given day. They are everywhere. And there you have it! A fabulous candle holder that really catches the eye! I placed it alongside an industrial bin holding our house wine and it looks right at home. The rusty metal really gives some tooth to this piece, don't you think? As you can see, you can use just about anything as a candle holder. What kind of junk do you use for candles? The year to create with no leftover clutter. Happy New Year to all of you and thank you for sharing your time with me!